He is both feared and admired, and for the past two decades he has been both lionized and demonized by the media. Outspoken, no-nonsense, and eminently fascinating, Joseph M. Arpaio captured the public's imagination from his first day as sheriff of Maricopa County, Arizona (a county larger than the state of New Jersey) in 1992. He has become an icon, not only in his own state, but around the world. For sixteen straight years he has averaged an unprecedented 80 percent approval rating. To his ardent followers, "Sheriff Joe," as he is universally known, is a hero: both for his toughness on crime - and criminals - and his sense of humanity. Sheriff Joe conceived the Tent City Jail, where he houses inmates in surplus army tents left over from the Korean War. Known as the "Alcatraz of Arizona," his jail brought back male and female chain gangs (for cleaning parks and roadways) and provides stringent, often unorthodox discipline. To discourage theft, the Sheriff insisted that his inmates be restrained with pink handcuffs, and don pink underwear and socks. Inmates are permitted to watch educational programming only, like news, Animal Planet, and The Weather Channel. And by eliminating comforts for his inmates, he has managed to shave $500,000 annually from the cost of keeping prisoners. But he also offers a wide range of educational and therapeutic programs for his inmates, though they're far less publicized. His opponents decry him for his iron-fisted approach, but no one can deny that Sheriff Joe is one of the country's most respected elected officials. In this book, "America's Toughest Sheriff" takes an uncensored look at some of the most difficult and important issues facing America today. The only local law enforcement official in the country directing his deputies to arrest illegal immigrants, Arpaio has shamed the U.S. Border Patrol, the Dept. of Homeland Security, and other federal bureaus, and become a prominent leader in the fight against some of our most pervasive problems. In Joe's Law he tackles the issue of illegal immigration head on: its relationship with drug trafficking, taxes, and crime, and how it impacts healthcare and education as well. Arpaio offers fair and innovative ways to solve this dilemma and many others, not only for his own state, but for the entire country. 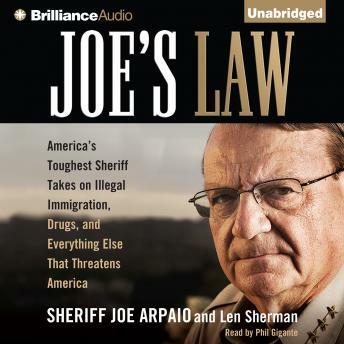 The Sheriff's struggle has personal consequences as well, as the book opens with the revelation of an all-too-credible assassination plot against him, arising from his aggressive and very public anti-illegal immigration campaign. Compelling and courageous, Joe's Law is a candid take on some of American society's most pressing problems, and one man's revolutionary vision for eliminating them.